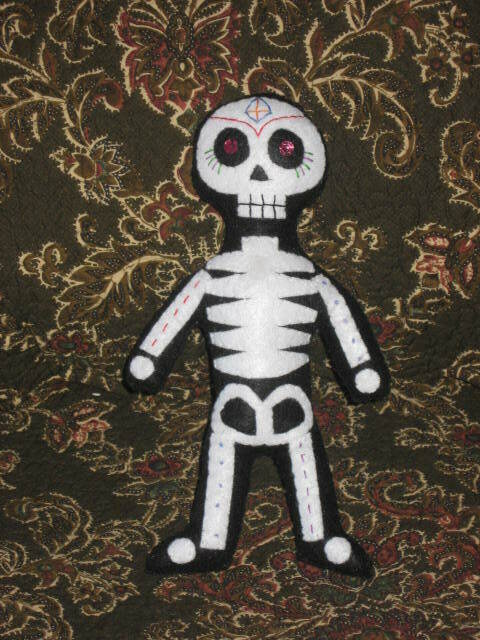 While at the Santa Fe flea market last August, my friend Leia bought a little felt calavera doll from a gal calling herself Skeletina. Leia named her little guy Xavier, and he became our trip mascot…but he was always lonely for a playmate. So when my husband and I were in New Mexico earlier this month, we went back to the flea market, and it was there that we found our little Carmelita. To check out Skeletina’s work, visit http://skeletina.com/. ~ by Dawn Elliott on October 28, 2011. What an adorable Skeletina doll! Thanks for sharing her in haiku. I love this work! Little felted skeletina’s. Off to check out the website. Oh I love the idea of felted skeletons. Your skeletina is awesome. I may just make some, they look easy enough. Thanks for sharing. Take care, have a great weekend. I am going to check the website now. I enjoy your playful spirit. Most certainly Xavier would approve. Carmelita is great! the website is fun! she has some stuff to make you smile! happy halloween or should it be “scarey” halloween? A corpes bride for Xavier How sweet. He will be thrilled. oh dawn…i was thrilled opening your post, eyes falling on Carmelita. i was sure you had made her in your felting class. love the romance i find here today. Carmelita and Xavier. Love is in the air. Loved the link to Skeletina. No one never need feel lonely on our haiku site! Thank you for your best wished for my daughter. What fun! Xavier has a playmate!